Did You Know Percé Rock Used to Have More Than One Hole? PrintBackDid You Know Percé Rock Used to Have More Than One Hole? Originally connected to the mainland, Percé Rock is a huge rock formation in the Gulf of St. Lawrence, off the tip of Gaspésie, that is now linked to the coast by a sandbar at low tide. This iconic landmark is impressive in size—the rock is about 450 metres (1475 feet) wide, 90 metres (295 feet) deep and 85 metres (280 metres) high—and is pierced by an arch-shaped hole, carved into the limestone by the sea. However, Percé Rock has changed greatly over time. 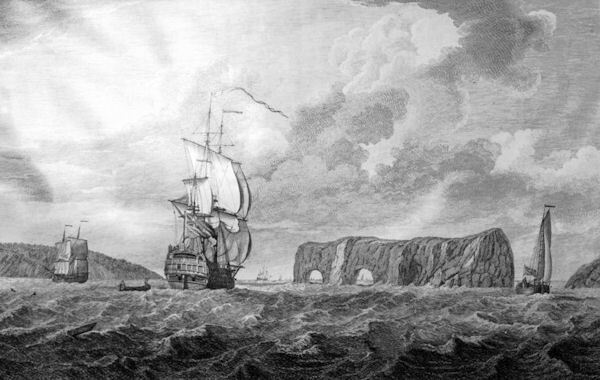 In fact, long ago it probably had four arches; when Jacques Cartier first came to the New World it had three, according to the explorer’s own accounts. One thing is for sure, only one 30-metre-wide (100-foot-wide) arch remains today: the second-to-last one collapsed on June 17, 1845, giving way to the forces of erosion. All that’s left of the outer arch is a separated pillar in the shape of an obelisk. With the combined effects of the wind and sea, and with the decreasing density and duration of the ice that protects it against waves during winter storms, Percé Rock loses large amounts of rock every year. According to the experts, the remaining arch may disappear in about 400 years. What are you waiting for? Come and see this larger-than-life phenomenon for yourself!